2014 is proving to be one of the most gratifying seasons for Community Financial’s Summer of Sharing charitable program. The campaign, now in its fourth year, involves donating $1,000 a day for 60 days during the summer to deserving community organizations. This year, the nominations are pouring in, making it difficult to choose just 60 organizations and programs to donate to. Providing for Paws is one of this year’s Summer of Sharing recipients of a $1,000 donation. Based out of Garden City, the mission of Providing for Paws is to provide assistance to low-income families with pets. This includes food, vaccines, and medical procedures, as well as animal rescue in the metro Detroit area. President and Founder Joanne Dixon and the rest of the Providing for Paws team have been hard at work this summer with a record number of parvovirus cases, countless rescue animals and a number of animal cruelty cases. 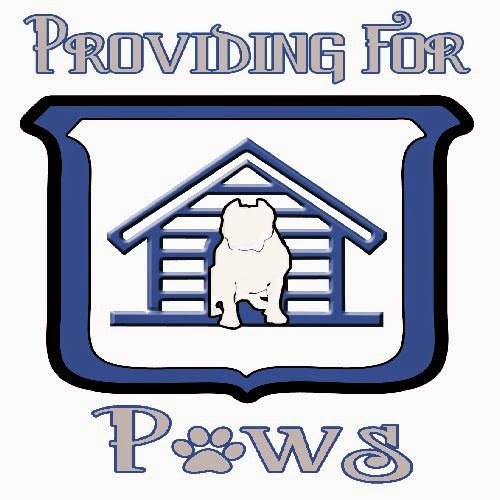 Noticing the organization was in need of some financial help, a wonderful volunteer named Nadine nominated Providing for Paws for Summer of Sharing. Nadine joined the organization after single-handedly saving a dog in the woods behind her home. The mother dog was found on her death bed nursing several puppies. Nadine paid for the dog to have surgery and bottle-fed all of her puppies while she recovered. She was introduced to Providing for Paws during her rescue endeavor and quickly fell in love with the organization’s mission. Nadine is now on the board and knows the financial struggles Providing for Paws faces daily – especially in the summer. Nadine hoped Community Financial would recognize what the organization does for the community and hoped it might have a chance of winning. During the 2014 summer, Providing for Paws had an average of over 80 animals in rescue and serviced 175 owned pets with food, spay or neuters and vaccines. During just the month of July, Providing for Paws had a vet bill of over $5,000. This bill included the treatment of nine dogs with parvovirus, one dog with a blockage and another dog that had been cut by its neighbor with a machete. The organization also provides cats with vaccines and microchips, as well as a test for feline leukemia disease. With expensive vet bills for around 250 animals, Providing for Paws was in desperate need of financial assistance. 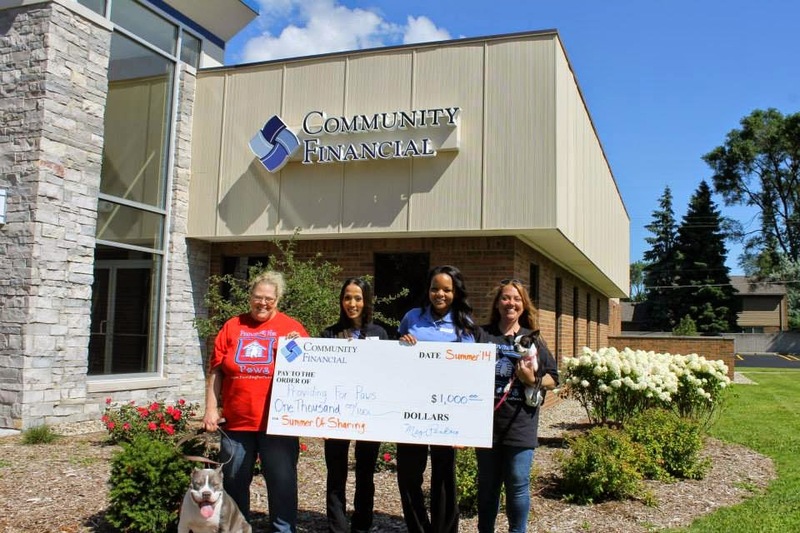 When Providing for Paws was notified that it was a Summer of Sharing winner, Joanne and the volunteers and team members were all jumping for joy. Joanne said she and all of the families that are able to keep their animals with assistance from Providing for Paws all feel very honored and blessed to have this opportunity. It is because of stories like this, demonstrating the good done in the communities we serve, that we keep bringing Summer of Sharing back. You may be able to save on car insurance in 15 minutes, or even in seven minutes, if you are willing to change insurance companies. What if you like the service you currently receive but just want to pay less? There always seems to be an excuse every renewal period why your premium went up a few dollars more a month. For the frugal-minded, like myself, I think about how those few dollars would be better left in my favorite high-yielding savings account. There are ways you can combat those renewal increases without changing your current coverage. Pretend you are a new customer and get an online quote at your current carrier's website. Compare the quote with your renewal rate. I filled out their questionnaire and received a quote reference number with a lower rate. With that reference number, I called my carrier and asked why the quote is significant lower than my renewal rate. If your carrier doesn't have the disclaimer "only for new customers" associated with the online quote, they must give you that lower rate. Telecommute? Less liability means more money in your pocket. If you drive your car less than average, you should get a break on your rate. For example, I work remotely one day a week. Since my yearly mileage decreased, my carrier decreased my rate. Check your discounts every renewal period. Don't assume your car insurance company has applied all discounts to your account. It is your responsibility to ensure all applicable discounts are applied. Every renewal period, give your insurance carrier a list of all your memberships. Both my alumni association and professional organization provides discounts with my carrier. I make sure if I can only have one discount, they apply the largest one out of the two. Clean record? Show me the money! Every car insurance company has a good driver discount. Every year of no claims, you should be rewarded. Make sure they apply that discount every renewal period. Use one carrier for all your insurance needs. You need insurance for your car and house or apartment. Why not bundle? I get a discount just by having multiple items covered by the same company. They want your business, so negotiate a great rate for all your insurance needs. Cash talks! Pay upfront and save in the long run. If you had cash to buy a car, you can negotiate a much better deal than sticker price. Car insurance is the same. When you pay monthly, you are paying a service charge to process each payment. Save that money and pay yearly or every six months. I save hundreds of dollars every renewal period. A great company will want to keep you. If none of these methods work for your car insurance carrier, it may be time to save hundreds on your car insurance by switching. Photo by Bob Jagendorf via cc. By Jeanine Lewis Copyright 2014 brass Media, Inc.
What Does Your Car Color Choice Say About Your Personality? The colors of the things around us are said to influence our moods and highlight personal attributes. Every item we own is an extension of our personalities, but how much does that really say about us? Specifically, what do the colors of the items we own say about us? Perhaps we don’t think of it right away, but most of us want our cars to reflect who we are because we spend so much time driving in them. Take a look at what your car color choice might say about your personality. White cars are the most popular on our roads today. At first glance, white cars portray a fresh, clean and modern look. This could reflect the driver’s own personal style, as they may also have a taste for elegance and enjoy the finer things in life. If you drive a white car, your personality probably includes honesty and purity, with a bit of confidence. Drivers of white cars tend to be more extroverted. The color black is often associated with power. That may be the reason why black is the most common color of luxury vehicles. If you drive a black car, you may be a bit of a sophisticate as well. You may enjoy things labeled as classic and timeless. As the driver of a black vehicle, you are not easily manipulated and are usually in total control of many areas of your life. Your personality may be a touch mysterious and a bit competitive. Silver cars are the third most popular vehicle color on our roads. The color silver is linked to innovation. If you drive a silver car, you might enjoy having the newest technology available. Drivers of silver vehicles are most often self-assured, unfailing and calm. They are also very detail-oriented people. Silver cars can represent luxury, wealth and prestige - those who own and drive them often subconsciously exude these qualities. Gray is a cool, sleek and practical color. As the driver of a gray car, you know who you are and probably prefer things on the subtle side. People who drive gray cars often don't want to stand out. The color gray accompanies wisdom and formality. If you drive a gray car people may describe you as refined, conservative and pragmatic. People who choose to drive gray cars are often reasonable, helpful and agreeable souls who like to go with the flow of life. If you want, or already drive, a red car you’re probably a go-getter looking for action. Red is a color that often represents confidence and fun. Similar to black cars, red cars can be associated with status. Drivers of red cars usually want attention and to look impressive to others. Red cars denote those who have high performance energy and drive, and who are full of courage and ambition. They can be impatient characters who live their lives at a fast pace. People who drive red cars are often enthusiastic about life and are passionate about their interests and themselves. The color blue symbolizes stability and safety. If you drive a blue vehicle, people might describe you as dependable, trustworthy and at peace with who you are. Like the driver of a white car, you might also like to portray a fresh look in your own personal style. Those who drive blue cars are generally consistent in their moods and attitudes. They also prefer to blend in rather than stand out in the crowd. Brown and beige are colors that are peaceful and earthy. The driver of a brown car values a long life of purchases and doesn't necessarily care about the newest trends or technologies available. Those who drive brown cars are usually known for being frugal and practical with their spending. You are probably a pretty happy person if you drive a yellow car! The color yellow represents joy and a positive attitude. Drivers of yellow cars are also more willing to take risks. Those who own and drive yellow cars have great self-confidence and enjoy having fun and embracing their inner-child. Green is nature’s color. If you’re driving a green car, you are probably very similar to the drivers of brown and blue cars. The color green symbolizes balance, stability and growth. Those who drive green cars are generally civilized, socially-conscious and well-adjusted people. If your car is dark green, you might like classic things and be more traditional. Those who drive lime and neon green cars on the roads tend to feel more young and hip. Orange is a warm color that has the ability to stimulate and arouse the senses. It symbolizes self-expression, flamboyance and passion. Orange also encourages energy, activity and motivation. Drivers of orange cards tend to be more on the frugal side. They aren’t afraid of going against the tide and enjoy having things that are a little unusual. 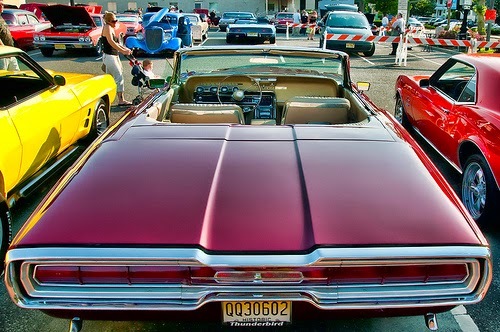 No matter which color you prefer for your vehicle, Community Financial offers low rates for used and new auto loans. Visit our Auto Resource Center to help you find the perfect color car that fits your personality.